What I really wanted to make when I first decided I wanted to learn how to knit, was a hat. But, being the semi-intelligent girl that I am, I knew it would not be smart to try and knit a hat as my first project. So I started with scarves. 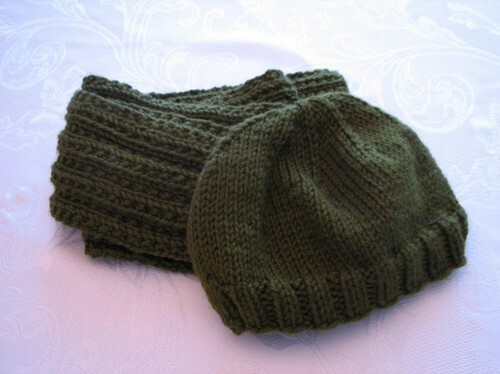 I knit two of those, decided I had the basic stitches down, and graduated to hats. It was intimidating, but I jumped in anyway. Since then I've knit 4 hats. Each hat only took a few days to do, and were really fun to make. First I wanted to knit a hat to match the green scarf I made. I was going to start with the simplest of hats, the roll-brim, but decided I wanted to do an inch or two of ribbed border instead. The size wasn't quite right, but it was wearable. Not terrible for my first attempt. 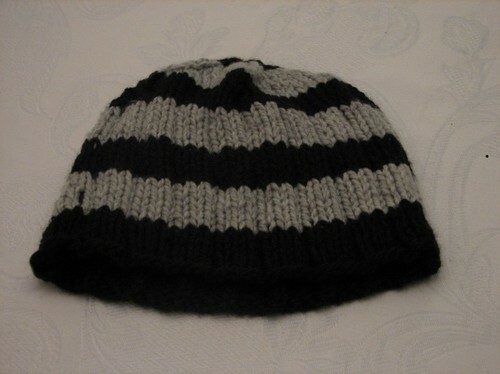 The second hat I knit was a roll-brim. It was in the same green color, with the same yarn. I didn't get any pictures of it though. I actually made it for a friend. More accurately, it was for my friend's 1 year old. I just wanted to knit something quick to get a gauge on the sizing before knitting the "real" hat. It was definitely a little too big, but hopefully she'll be able to wear it early this coming fall/winter. So then I knit the "real" hat. My friend and I were looking at various patterns, trying to decide on one, and she settled on an adorable strawberry hat. It seemed easy enough for me to attempt so that's what we went with. And, oh my gosh, I think it came out pretty darn cute, if I do say so myself. I was pretty proud. My friend sent me photos of her daughter in the hat and it was absolutely precious. A huge sense of accomplishment right there. I could hardly believe that I actually crafted that myself with my own two hands. I have a much more analytical and mathematical mind than a creative one, so these things shock me sometimes. Then I decided to try another one for myself. All ribbing, and alternating between two colors. Not nearly as cute as the strawberry one, but I didn't think it was as appropriate for me to be going around in a hat that looks like a strawberry, my being 31 years old and all. Good job on the hats! I've been knitting for 20 years and most of my hats don't look half this good. I guess maybe I'll stick with scarves! Lol. Man - if I learned how to knit my cat would be wearing knitted scarves and hats...very dangerous! bobocela, thank you! If you are interested in learning how to knit, you totally should! I was very intimidated and didn't do it for years, but I finally jumped in and it's been awesome. It's much easier than I had thought (I admit I have only done easy stuff so far). It was 100% self taught using YouTube videos and other blog posts/web sites. Pretty much the ones I've included in each of the knitting posts. I know I've said it before but you really are gifted with this! 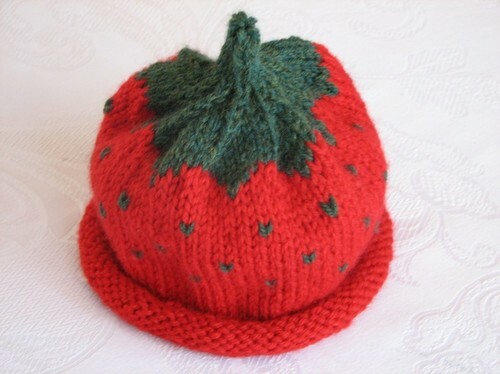 The strawberry hat is fantastic! Where did you find the pattern? Marisa, thank you :) You may have said it before, but it never hurts to say it again! Hehe, I kid. Stories, advice, and random thoughts from a thirty-something female. Many people in their thirties are dealing with common issues and concerns. Some of these include buying a home, establishing a career, starting a family, and dealing with aging parents. I will blog about all these things as well as other every day stuff as I make my way through this third decade of life. You can read more about the author behind thirty-something blog on the About Me page. This page contains a single entry by Erin published on March 21, 2010 9:13 PM. Back At It was the previous entry in this blog. How Many Times A Day Do You Wash Your Hands? is the next entry in this blog.